Spring officially starts this week, but sadly it’s still a little cold, windy and rainy in HotLanta. Enough about spring! The summertime is my favorite time of the year. Why? For one, I was born on summer solstice so I think it’s engrained in me for that to be my favorite time of the year. Secondly, I absolutely love my tanned complexion that the summer brings. In the winter, I get very pale and I hate it. I have to wear different foundation and have to use a ton of bronzer to brown me up a little. The summer sun gives me a browner complexion, but I also know a lot of Black women who tan in the fall/winter/spring to keep away from the paleness that some of us can get. I know a lot of you all are thinking, Black women go to get tanned? Absolutely!! While I was never one to hit the tanning bed, I have thought of healthier options like some of my friends have done. My ultimate goal is to have that summertime glow year-round. Luckily, I have teamed up with Suave® Professionals Body Care, to launch their NEW Visible Glow™ Self-Tanning Body Lotion! 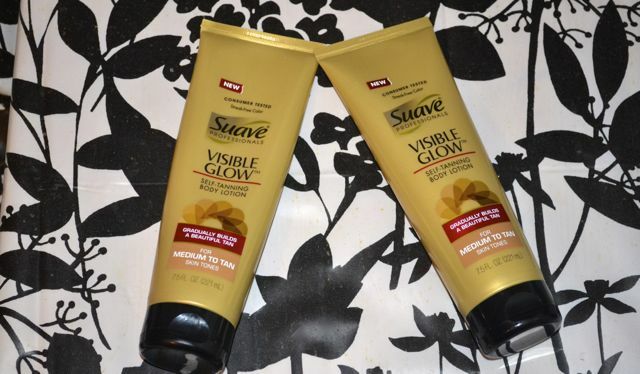 If you know me, you know I love Suave® for their hair care and their body care products. This self-tanning body lotion is about to be my new fix! Even though I did get a nice tan while in the Caribbean, my focus now is to even out my skin tone and smooth my complexion for a gorgeous bronzed glow. You know, sometimes when you tan naturally outside in the sun (beyond the obvious skin health dangers) you simply can’t avoid tan lines. I can really see how pale I was when I have tan lines lol! They say you can see results in 3-5 days so I can’t wait for you all to see my results! And the best part—you have the chance to get your glow ￼ on safely with me! Visit the Suave Beauty Facebook page for a chance to win free Suave® Professionals Visible Glow™ Self-Tanning Body Lotion and test out your glow virtually by applying the Visible Glow photo filters to add a gorgeous tan to your photos. Stay tuned for next week’s post where I’ll sharing my first before and after photos.